Herkimer Diamonds are not diamonds at all! In fact, they are clear, double-terminated (pointed on both ends) QUARTZ crystals found hosted in the dolostone layers of Herkimer County, New York. Belonging to the quartz family, Herkimer Diamonds have the chemical formula SiO2 and belong to the hexagonal crystal system. Although double-terminated quartz can occur in many places across the globe, only those found in Herkimer County can be called "Herkimer Diamonds," and few other localities produce examples pristine enough to rival natural diamonds as a gemstone. Herkimer Diamonds have crystal clarity and a natural crystal habit that appears faceted because of the 18 crystal faces visible in most specimens. These characteristics result in a natural sparkle that can only be obtained in the faceted diamonds of jewelry stores through time-consuming work. In addition, Herkimer Diamonds have a hardness of 7 out of 10 on the Mohs Hardness Scale, making them extremely durable for everyday wear and tear. 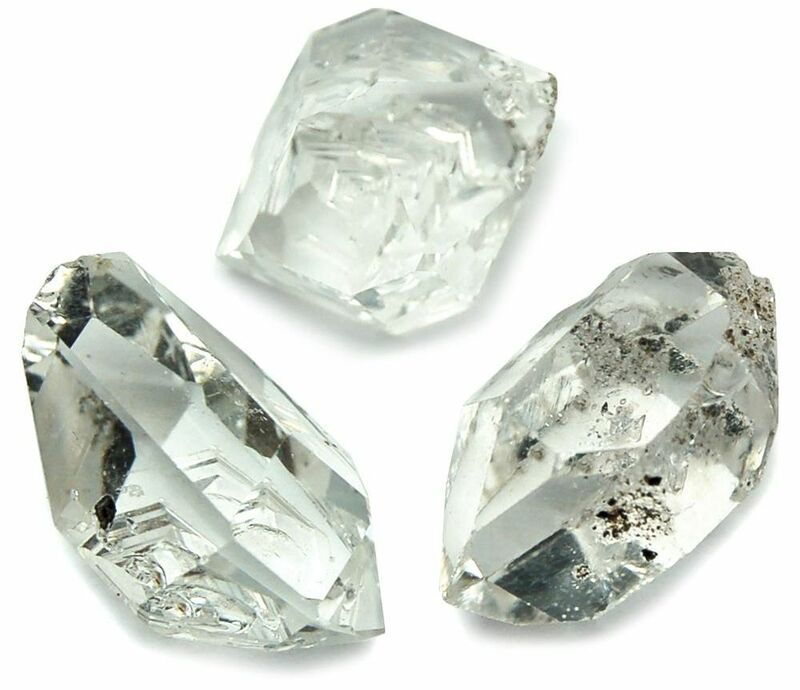 In addition to this resistance to scratching, Herkimer Diamonds do not break or chip as easily as diamonds that have THREE planes of cleavage to break along. All in all, Herkimers outshine diamonds in appearance. Now, the quartz family, to which Herkimers belong, has a long history in the gem and metaphysical world due to its variety of colors and applications. Clear quartz possesses a unique combination of energetic properties that give it versatile application in the new age community. Clear crystal quartz (1) directs energy, (2) amplifies energy, (3) transduces/transforms energy, and (4) easily accepts programming. These properties of quartz allow it to clear/cleanse other stones energetically, while also amplifying their innate properties. In addition quartz can be programmed with any metaphysical property. The programming process is intuitive and individual in nature, but usually begins by clearing the quartz of previous programs and then setting a new program (or intention). For example, I use the method of visualization by seeing the energy of the stone and moving my own energy through it, erasing whatever patterns may be present. Then I visualize what I would like the quartz to do such as take in dark, negative energy from other stones and reinfuse them with light, positive energy. I set my intention and give the quartz a specific purpose. Many stones have innate properties that allow them to help with x, y, or z when activated by your intention, but quartz is one of the few stones that will accept non-innate programs. Herkimers have become a rival for April's traditional birthstone Diamond. As an adornment, Herkimers have all of the sparkle and durability of a diamond even in their natural crystal habits. For this reason it's becoming more widely used in jewelry. Although many myths and legends have origins deeply rooted in history, it's important to remember that every myth was once young. Recently a new children's story entitled "The Legend of Herkimer Diamonds" became published. This cute, rhyming poem tells the story of Reina, the Queen of Kimer, and her quest to find the perfect gemstone for her royal crown. Throughout the story, Queen Reina's knights send her precious gem after precious gem as options for her crown, but nothing resonates with her. I do not want to spoil the story, so let's just say that ultimately she chooses HerKimer Diamonds to be the national treasure. With all of its beauty and power, it's no wonder that this would be her gem of choice.